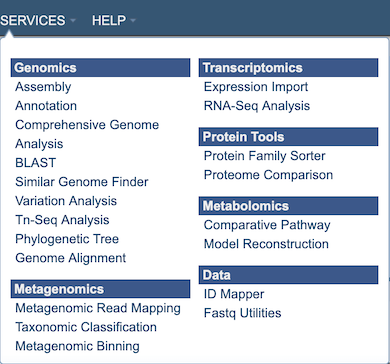 The Model Reconstruction Service integrates and augments technologies for genome annotation, construction of gene-protein-reaction (GPR) associations, generation of biomass reactions, reaction network assembly, thermodynamic analysis of reaction reversibility, and model optimization, to generate draft genome-scale metabolic models. The service is capable of generating functioning draft metabolic models of an organism starting from an assembled genome sequence. Additional information is available in High-throughput generation, optimization and analysis of genome-scale metabolic models. 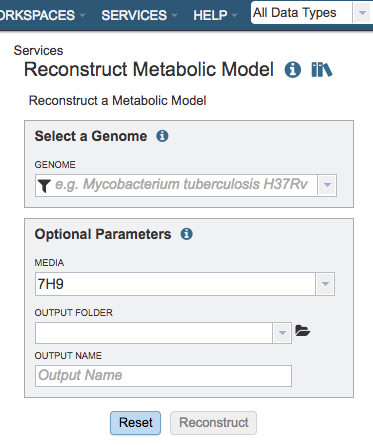 The Model Reconstruction submenu option under the Services main menu (Metabolomics category) opens the Reconstruct Metabolic Model input form (shown below). Note: You must be logged into PATRIC to use this service. The Model Reconstruction service is also available via the PATRIC Command Line Interface (CLI). Selection for a predefined media formulation from a dropdown list for this model to be gapfilled and simulated for flux-balance analysis (FBA), e.g., GMM – Glucose Minimal Media, NMS- Nitrate Mineral Salts Medium, LB - Luria-Bertani Medium. The workspace folder where results will be placed. Name used to uniquely identify results. Reconstruct: Launches the model reconstruction job.